in developing your spiritual awareness and raising your spiritual vibration. Including a Section with FAQ about Psychic Attack, Ghosts, Haunting, Possession, Entities, etc. Sherry Whitfield has facilitated workshops across the world on various spiritual, metaphysical and esoteric subjects. 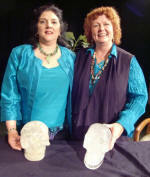 Clairvoyant since early childhood, Sherry grew up in a family where "ESP" type experiences were not unusual. 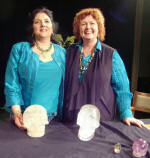 A guest on television and radio, she is known for her down to earth and gently humorous approach to spiritual topics. Sherry emphasizes simple, practical applications for spiritual awareness, personal and professional development. 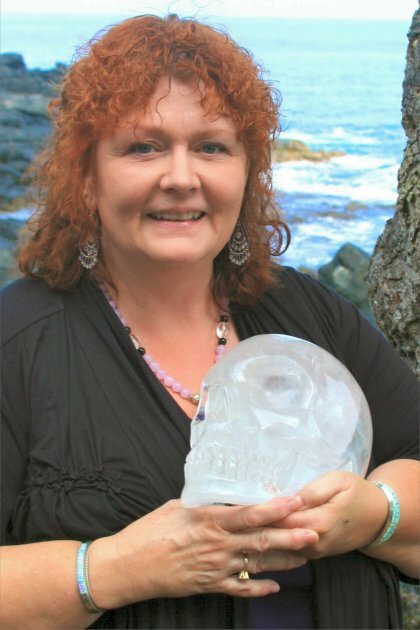 Sherry has been a guest on numerous radio and TV shows including recent interviews on Coast to Coast AM radio and she is in the History channel series, Ancient Aliens and various other productions. 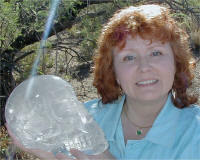 She is included in many books on spirituality and crystal skulls. She is featured in two films: Meet Your Angels and Echoes from the Ages: Talking Story with Crystal Skulls. Sherry's work focuses on moving beyond the superficial fascination of phenomena, and toward a path of spiritual balance, transformation, and self-responsibility. Of prime importance to her is the cultivation of compassionate detachment and an ever increasing ability to give and receive love. Learning to recognize the Guidance that one is already receiving is a useful and life altering experience. Workshops and study groups are non-denominational and emphasize the importance of self-acceptance, tolerance and the consistent self-discipline necessary to build a solid and lasting spiritual foundation, no matter what ones’ personal religious or spiritual beliefs may be. of a genuine, life-size, ancient crystal skull known as "Synergy." 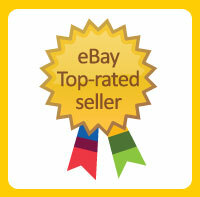 Click here for more information on this fascinating artifact! THANK YOU TO THOSE WHO WE HAVE MET IN OUR TRAVELS! In Sherry's Own Words... Intuitive abilities run in my family. Just about everyone, on both my mothers and fathers side of the family, have a fairly strong "sixth sense" of some sort. Most of my relatives have had consistent, paranormal experiences, and a kind of intuition that often defies logic. I was born being able to see the energy (auras) around people, animals and other things. This is often called an aura. If you'd like to see a bit of what I see, via some of the aura drawings I've done, you can click on the hands at the right. Pictured are Jeanne Michaels, Jaap van Etten, Sherry Whitfield, Pieter Tigelaar and Bob McCullough are the founding Fellows of the Crystalline Fellowship. Sherry and her close friend Dr. Jaap van Etten have wanted to collaborate in the work that they both do with crystal skulls, spirituality, subtle energies etc. They have continued to work towards that goal and now there has been a huge opening! The time is right and it has begun! This is just the very beginning - but it IS a beginning of something a little different in this field. This is the birth of a true Fellowship - encompassing far more than two people. This alliance has been forged in love, friendship, respect and the mutual desire to assist in raising the spiritual vibrations of all Beings involved in this co-creation known as our Universe and Humanity! They agree that the key to this is Love. In the coming months and years the Fellowship will share resources, offer information and online courses from top people in the various fields and be a place to have honest discussions. 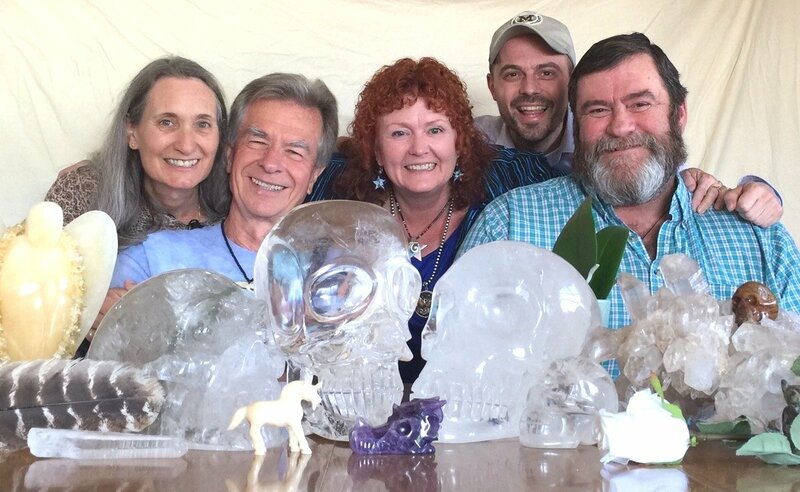 Topics will be as varied as crystal skulls, earth energies, angels, healing, working with subtle energies, multi-dimensional Beings and much more! Below is a short video done by Sherry and her friend Pieter Tigelaar. She's talking a little bit about her background. 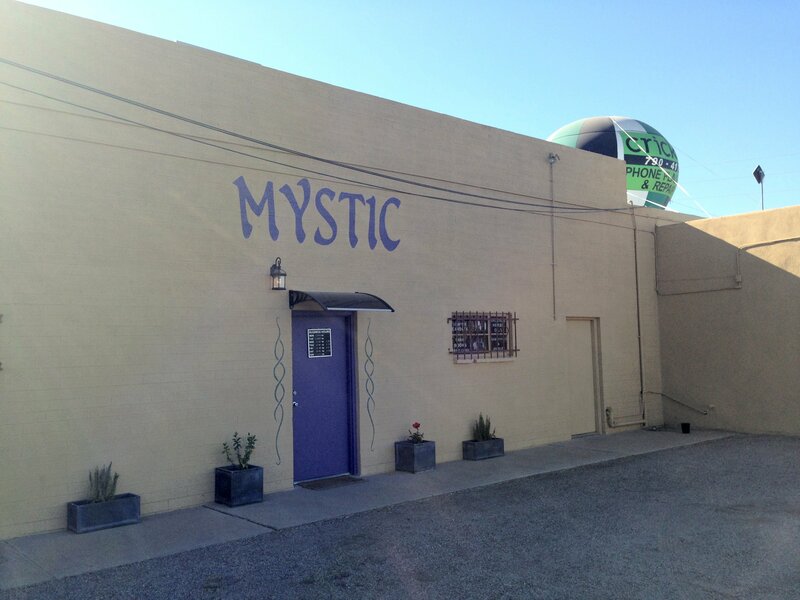 Sherry and Synergy are in and around the Southwestern U.S.
December 16 - Tucson, Arizona- at Mystic Candles - HOLIDAY PARTY! More specific dates added soon! Some great events are coming up!! Come see Synergy and Sherry!! SPIRITUAL STUDY and SUPPORT GROUP! This local (for Sherry) group is by Donation! I wanted a monthly group in a local venue so that I could do this for a small donation - it's not about money - so if things are tough for you right now and you do not have extra money to spare it's OK! Come join us anyhow! PRIVATE SESSIONS are held at Mystic Candles in Tucson, a couple of times a year. It's first come First serve. All people are different and that is why all private sessions are different too. With each session shamanic rituals and items will be used to activate the ancient qualities of Synergy. Under the guidance of Sherry you are connected to Synergy and its transformative powers. You will be reconnected with your blueprint, your true inner-self. Also... Check Sherry's Facebook Page for current events! 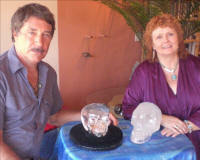 Crystal Skulls naturally work together... humans could learn from them in this way! We do not have to agree on every little detail of every little thing to co-operate and treat each other with respect! taken in Sedona, Arizona on September 27, 2008. 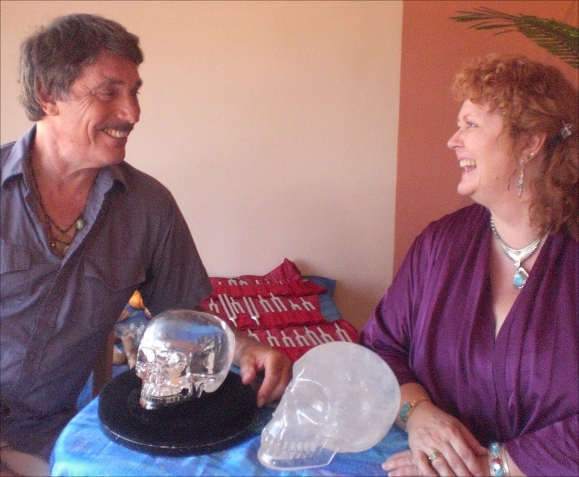 Bill and Sherry agree that the time is ripe for caretakers of ancient and contemporary skulls to join together in to bring about an increase in love and spiritual awareness. Sedona, Arizona at the "Four Winds Wisdom Gathering." Check back for details on the next one in 2009! I am also interested in sharing techniques for lucid dreaming. This is when you are aware and 'awake during your dream. You know you are dreaming and maybe you can change and guide the dream -- or more! I have quite a few exercises on this site that are simple enough for anyone to try. 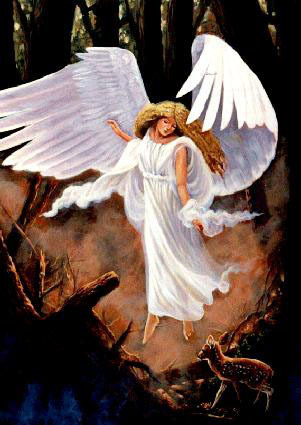 If you have a lucid dreaming technique or if you have an angel story or experience that you'd like to share, let me know by email and I will post them in a new section that I am working on right now. Whatever your interest in spiritual growth, I probably have something of some interest somewhere on this site. Enjoy yourself and please check back regularly, as I will have more things up soon! PLEASE NOTE: I rarely do individual readings anymore. I do try and answer your email as best as I can, time permitting, but please, don't ask me for a reading. I've learned a lot from doing readings (for over 4 decades now) and I don't regret doing them, but I only do readings when, and IF I am guided to do them. THAT IS VERY VERY RARE. PLEASE do not email me and ask me questions that are really asking for a reading without actually asking for one. I have had over 1200 emails since January 1, 2012 asking me that sort of thing. I am more interested in assisting and supporting people who want to experience these things for themselves - that's why I started doing workshops. I hope to pass along some technique and/or insight that will be of use. The people I've met at my workshops and through this web site have been a tremendous blessing in my life! And remember: It really doesn't matter what I can do... It only matters what YOU can do!